Meet Joe and Elisa, and their two children Kathy and Konnar. Joe and Elisa want to teach their kids to recycle for the benefit of our planet. They also want to learn new ways of reducing waste in their home. Meet Cassandra Johnson, Ashley Tompkins and daughter Martaeyah Walker. Cassandra wants to participate in Dare to Go Zero her daughter, who cares about the environment, but Cassandra has no idea how or what to recycle. Meet Julia Zimmerman, Jason Brian, and their son Will. With a new baby and six Chihuahuas, their household produces a lot of waste. Jason is an avid recycler, while Julia is a work in progress. 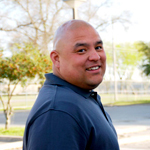 Through an audition process, Michael Bocanegra was chosen to represent the Austin Resource Recovery Department and the City of Austin as host of Dare to Go Zero. He is an Austin resource Recovery employee who works as an operator in bulk collection and has been with the City for almost five years. He's lived in Austin all his life and is married with four children.